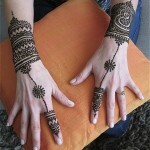 Applying mehndi is a very diversified art which has different patterns and styles. 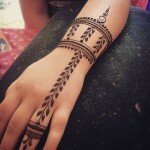 It can be done in so many ways like the traditional way, the Arabic, and the fusion style and so on. And though full hand patterns have their own charm but you cannot use this style every time. 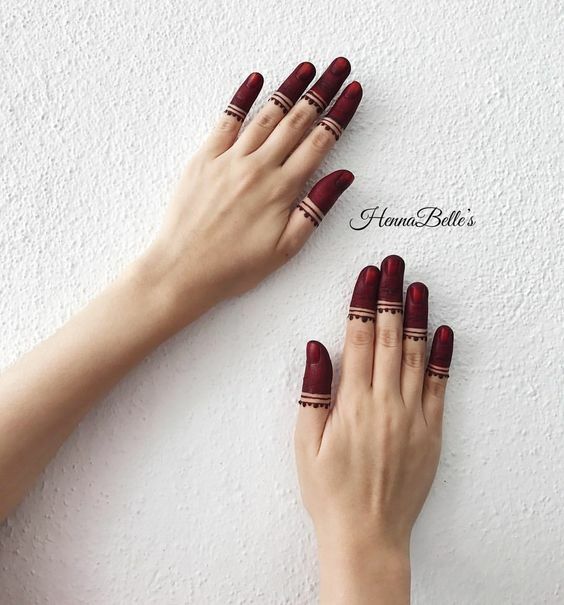 But these simple yet stylish finger designs are something which everyone would want to explore and they can be done easily for any occasion. -The glove inspired design is unique and great to fake a glove look. Simple use of vertical and horizontal lines along with dots create a nice mesh look. You can carry this design with a western attire like a dress or a gown. -If you like your fingers to be seen with stack rings then this design is for you. Horizontal blocks in different sizes gives a fake ring look, which you can fill with the pattern of your choice. 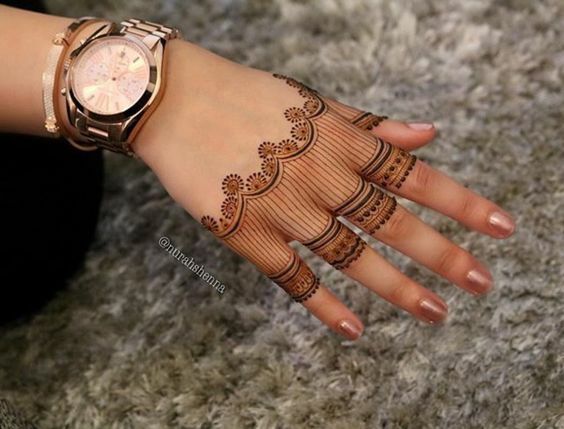 An addition of a floral motif at the end of one finger would make it more alluring. 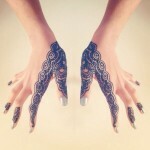 -And while you apply the design on your fingers, you can choose a similar pattern for the wrist too. Its great to have a similar pattern for the wrist band. 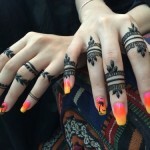 -You can also wear your favorite hand jewelry with a pattern like this. Its so simple and is super easy to do yourself. 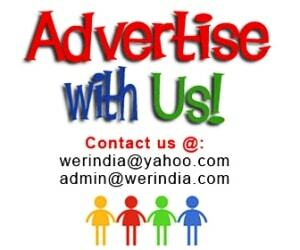 All you have do is to make ring like patterns in thin and thick lines with few dots patterns to finish the design. 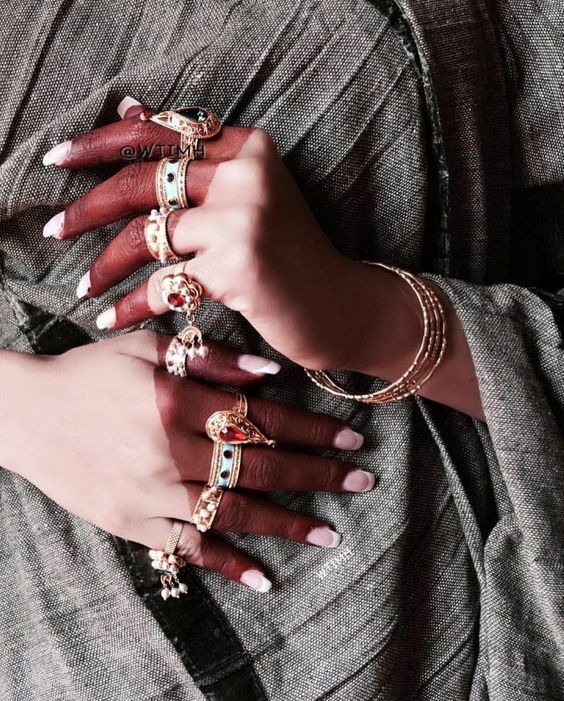 -And if you are the one who loves wearing rings like no other jewelry, then this can be the easiest and the most strong of all the patterns. -The simplest of pattern sometimes make a great design, and this one is exactly the same.